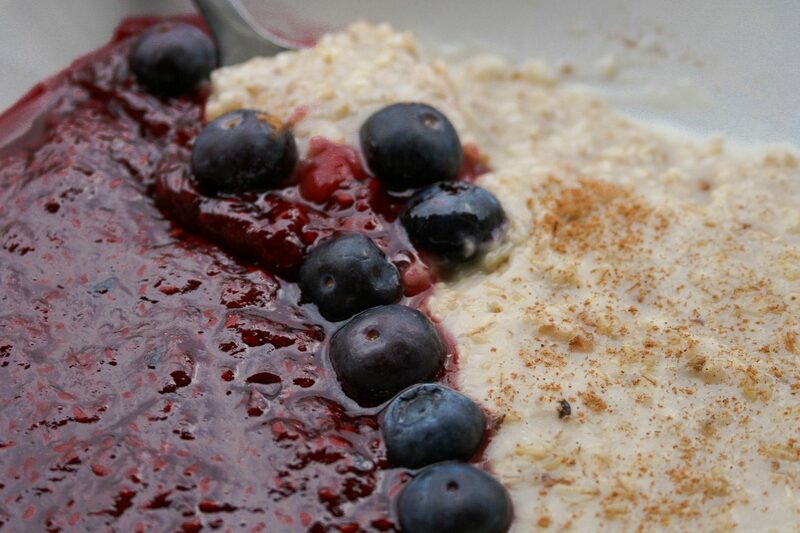 Porridge always makes a great breakfast choice, be it during weeks days or over weekends. I found fresh raspberries and blueberries on the market the other day and stocked up my fridge. This recipe was created with those 2 in 1 yogurts in mind, you know the ones where fruit sauce and yogurt are in separated containers and then you mix them to get the sweet and sour flavor sensation. 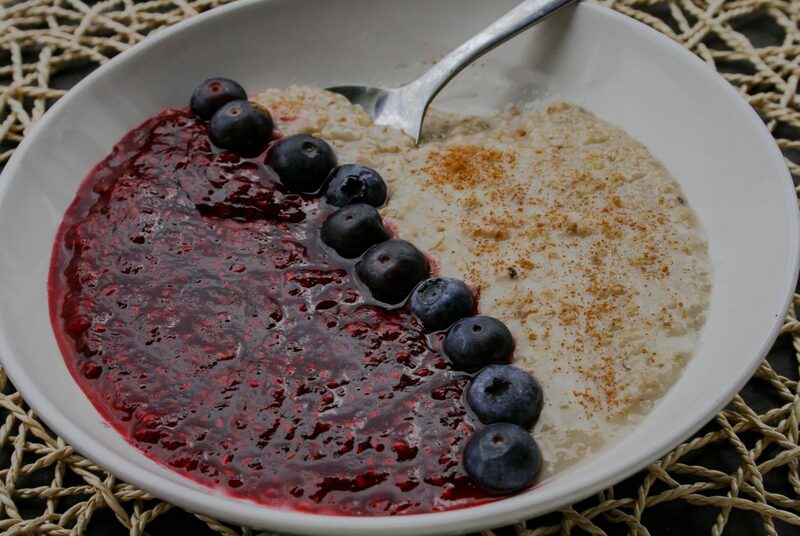 Creamy, thick and sweet porridge with sweet and tangy raspberry syrup for the hit of freshness. This recipe is vegetarian, without sugars, dairy products or saturated fats. 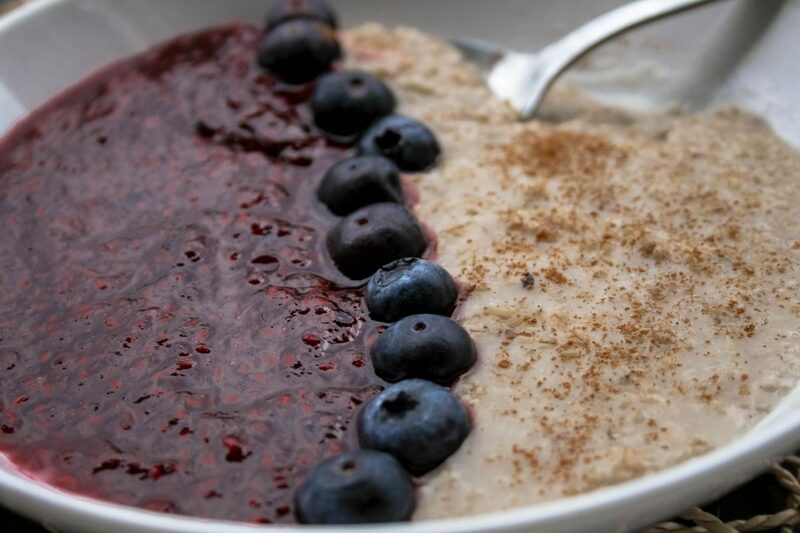 If you want to make it gluten free opt for the gluten free oats or buckwheat. If you wanna make it vegan exchange honey for rice, agave, maple or golden syrup. Pour 400 ml of water into a pot, add the rolled oats and pinch of salt. Put on medium heat and bring to boil then reduce to simmer and cook for 10 minutes. Add the plant based milk and 2 teaspoons of honey and cook for 5 more minutes. When you start cooking the oats, put the raspberries in a frying pan with 30 ml of water and 1 teaspoon of vanilla extract. After 5 minutes add a heaped tablespoon of honey. Cook until the liquid evaporates and you’re left with sticky syrup. Serve in a bowl with a pinch of cinnamon.